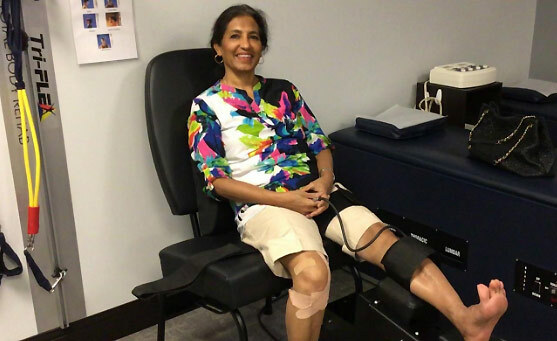 What is Knee Decompression Therapy? Knee Decompression uses the patented Knee on Trac system to separate the two main bones of the knee joint in order to reduce pain, increase function, and promote tissue healing. How Does Knee on Trac Therapy Work? By gently separating the joint space between the bottom of the femur (thigh bone) and the top of the tibia (shin bone) we can create a vacuum effect inside the knee joint which brings more nutrient rich fluid to the area. This also stretches the tendons, ligaments, and other soft tissue around the joint. This combined effect helps to re-establish some of the natural joint space and cushioning in the knee. This reduces pain, increases normal motion of the joint, and promotes tissue healing. Which Conditions Respond Well to Knee Decompression? Some patients experience some mild soreness after the first few treatments if the degeneration in the knee joint is very advanced or lots of scar tissue is present. A typical session is 5 to 10 minutes depending on the patient’s condition and need. You will be seated, with your leg extended at a comfortable angle. A strap is used over the upper thigh and an inflatable cuff is used just below the knee to secure the leg. 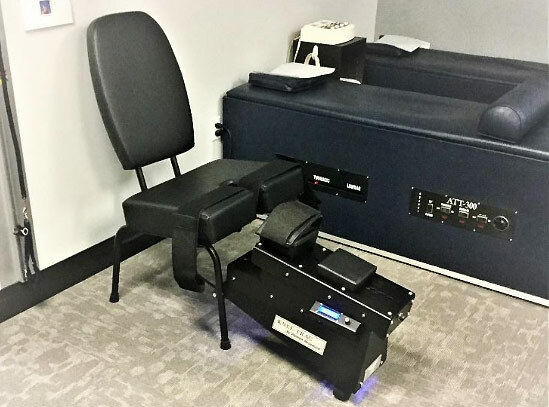 Our therapist will then program the Knee on Trac equipment with the appropriate settings depending on your condition. You will feel a gentle separation of the knee joint. Most patients see positive results in the first few treatments. Your treatment will often be combined with other therapies designed to produce the fastest and most complete recovery possible for your individual condition. Total number of treatments recommended will depend on the severity of your condition along with your personal treatment goals. Tiku M.L., Sabaawy H.E. Cartilage regeneration for treatment of osteoarthritis: a paradigm for nonsurgical intervention. Therapeutic Advances in Musculoskeletal Disease. 2015;7(3):76-87. doi: 10.1177/1759720X15576866. Van Valburg A.A., Van Roermund P.M., Marijnissen A.C.A., Wenting M.J.G., Verbout A.J., Lafeber F.P.J.G., Bijlsma J.W.J. Joint distraction in treatment of osteoarthritis (II): Effects on cartilage in a canine model. Osteoarthritis and Cartilage. 2000; 8 (1) , pp. 1-8.